Transportation Safety Administration employees filled boxes, bags and crates with food donated by Foodshare, a regional food bank. Lunch time feels different for TSA officers at Connecticut's largest airport, especially after missing their first paycheck. Instead of sitting down to eat, they headed to an employee parking lot to fill bags with food donated by Foodshare, a regional food bank. Steve Gilbert is a father of five who's worked for TSA for more than 15 years. "When you're trying to feed your family, pride kind of takes a backseat," said Gilbert. "They have some chicken, they have a veggie platter, they have some squash, some onions, a couple of soup bowl things from Panera, so I took it all. A couple of meals over the next few days -- that's going to be huge." Gilbert drives from Westfield, Massachusetts five days a week to Windsor Locks for his nine-hour, early morning shift that begins at 2:30 a.m.
"It's all we can think about," Gilbert said. "We're coming to work, you have no pay, you're trying to pay [for] gas, you're going around to creditors." His wife's income is taking care of their mortgage, insurance, and electric bills. Gilbert says his family has enough savings to last through early February but after that, they'll have to "live very frugal lives and muddle through." Some of his co-workers are single parents and others are parents who are both employed by TSA. An assortment of frozen meats, along with fresh produce and groceries were donated to TSA employees by Foodshare, a regional food bank. 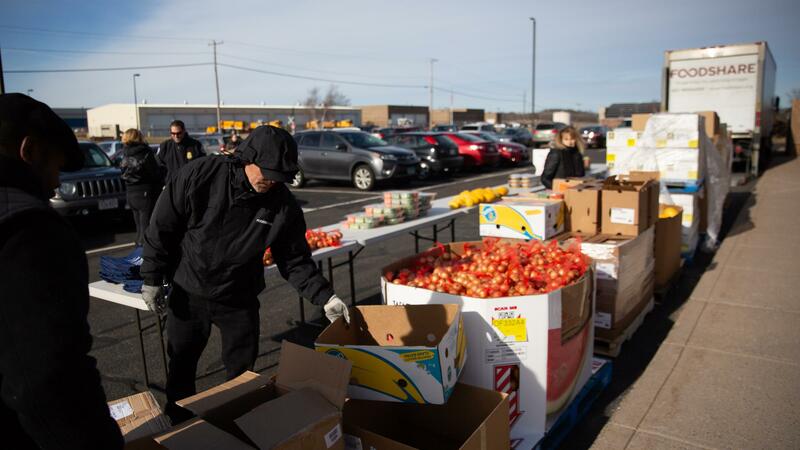 Cherie Trice, Foodshare's director of giving, stood outside in below-freezing temperatures stacking fruits, vegetables, juice, and other food items on tables set up near the parking lot's sidewalk throughout the afternoon. TSA employees lined up before the food distribution started at noon. "There was already a fair amount of people waiting for us who've told us how grateful they are to us for doing what we're doing," Trice said, "and I've tried to share that we are so grateful to them for keeping us safe and our families safe at the airport and in the skies." Volunteers from Foodshare, a regional food bank, set up various food items for TSA employees to pick up during an afternoon "pop-up pantry" event. A van shuttled TSA officers back and forth to pick up food and to bring pre-packed bags to their co-workers who couldn't stop by the pop-up. There are more than 300 officers employed at Bradley International and Tweed New Haven airports. Foodshare president Jason Jakubowski worked with the state's TSA union to organize the event. "People are food insecure for a short period of time, some for longer periods of time," Jakubowski said. "But when they are, our job is to be out there in the community helping them." The food bank provides Hartford and Tolland counties food and other related resources for those in need. 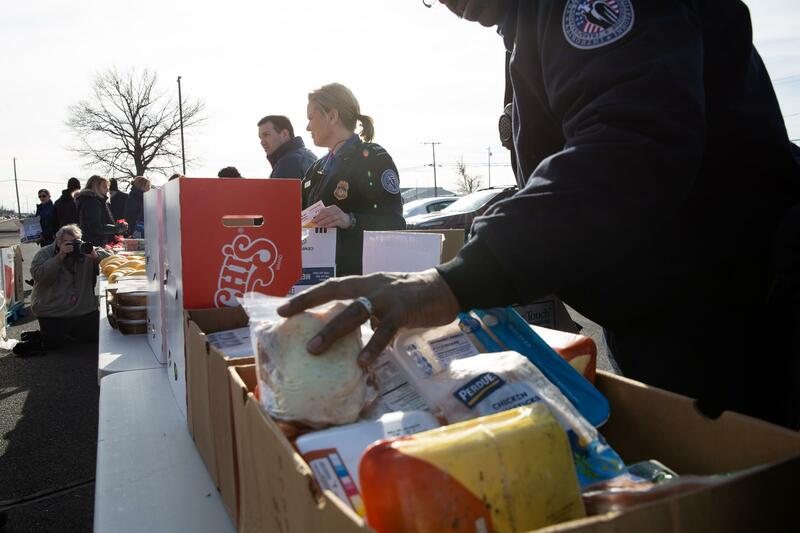 The organization plans to create "after-hours" food pantries for TSA and other federal employees as the shutdown continues. Thanks to what he calls a “quirk in history,” Connecticut Senator Richard Blumenthal said that members of one United States military branch may not get paid in full during the government shutdown.